In 1987, Tunis native Jean Touitou created the French fashion label A.P.C. (Atelier de Production et de Creation). Over the years A.P.C. has distinguished itself as a prestigious clothier of fine apparel based on classic items and silhouettes. A.P.C. is headquartered in Paris with primary stores sprinkled across various parts of the world including France, Germany, the United Kingdom, Belgium, Tokyo and the US. 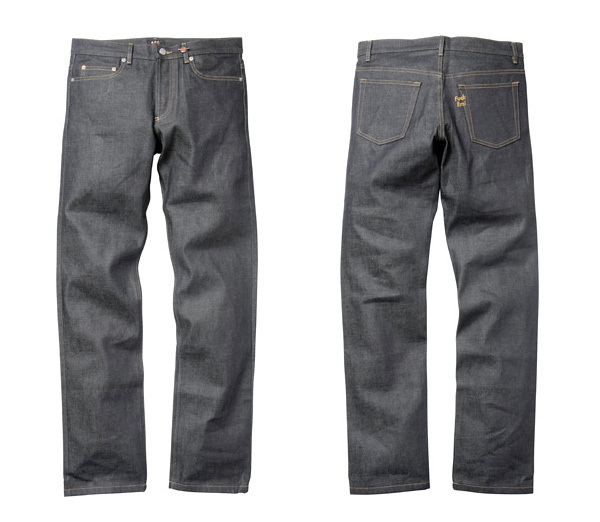 The jean, a specially designed version of A.P.C. 's classic New Standard style, will feature a back pocket embroidery and a removable pin. The tee will come in two colors; red (available exclusively at Supreme stores) and black (available exclusively at A.P.C. Stores). Available in-store and online on October 1st. Available in Japan on October 3rd.